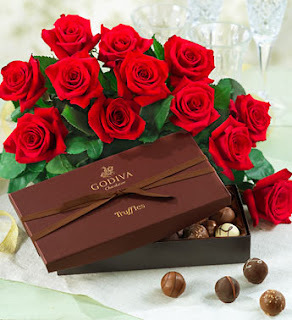 Ascending Butterfly: Win A Dozen Long Stemmed Roses and Godiva Chocolates for Mom from 1800flowers.com! Win A Dozen Long Stemmed Roses and Godiva Chocolates for Mom from 1800flowers.com! This giveaway is now CLOSED. Thanks so much to our wonderful sponsor 1-800flowers.com! We look forward to working with you again! The winner has been notified and upon confirmation, follower name will be posted both here and on our homepage. Remember: There are great giveaways active on the upper right hand side of the page! This was gift #3 in our first annual Mother’s Day Buying Guide! We are now launching our third gift in our first annual Mothers Day Buying Guide! We started with the gift of CleanRest (giveaway ends on 04/28), followed by the gift of perfume (giveaway ends on 05/01) and now we are moving on to a classic gift for Mother's Day, Long Stemmed Roses, one dozen to be exact, and to accompany the most breathtaking bouquet of roses ever? An elegant box of Godiva Truffles! An amazing way to say 'Thank You' to your mom! If you are apprenhensive about the idea of 'Mail Order' flowers, let me put your mind at ease, 1800flowers takes special care in packaging and shipping, the flowers are attached securely to the box to prevent damage to the flowers while the box is in transit. When mom opens this box, the 'wow' factor is guaranteed! Remember that long stemmed roses do have thorns, so take special care when removing them from the box and while arranging the bouquet. They are a very rich deep red color and will begin to bloom more fully 2-3 days after arrival. I didn't experience this, but if any petals are 'burned' in transit, just pull them off, this will not harm the flower at all, and will preserve it's beauty when it does fully bloom. While they are Shipped overnight to ensure freshness and arrive ready to arrange, I would still suggest that when you remove them from the box you remember to cut the stem just a little bit with flower shears under running water before putting them in the vase. 800flowers also includes the 'preservative' packets which helps the bouquet 'live' longer. And remember to customize the message to go along with your flowers, telling your mom how much you appreciate her! Don't you just ♥ 1800flowers.com? I know I do! Ƹ̵̡Ӝ̵̨̄Ʒ - How to Win: (1) You must be a PUBLIC follower of Ascending Butterfly to be eligible for this and all giveaways. Indicate in your entry that you follow (if your 'comment name/user id' differs from your profile id, please let me know what name you follow under) and (2) Visit 1800flowers Mother's Day Gifts - and post the URL of another bouquet you like aside from the giveaway bouquet of course, as your comment entry! Please post the LINK, not the name! (3) You must also leave your email address somewhere in your comment. (You can format it this way for security, example: ascendingbutterfly AT mail host DOT com, If it is visible in your profile, just say so, that's OK!). Please follow the easy 1, 2, 3 steps to winning! This giveaway is open to USA residents who are 18 years of age or older. (Leave a comment with the tweet’s url so you can get a valid entry (click on the time your tweet was sent to get the direct URL and then copy and paste it here). You can tweet once per day. I "liked" you on Facebook under the name Mary Happymommy. I "liked" 1800 Flowers on Facebook under the name Mary Happymommy. I now follow you on Twitter @mami2jcn. I voted for your mom in the ICE.com contest - good luck! I voted for you in the Macy's fashion director challenge - good luck! I voted for you in the Bloggers Choice Award - hope you win! I'm a follower! I like http://ww11.1800flowers.com/product.do?baseCode=90210&dataset=10394&cm_cid=d10394. I love this bouquet: http://ww11.1800flowers.com/product.do?baseCode=90229&dataset=10394&cm_cid=d10394. I am a follower of your blog. I follow your blog publicly.I like the bouquet. Follow on Twitter (stamat86) and by e-mail. I follow and I love the Mays Rose. Re try of my main entry. I forgot the URL last time. I follow you publically as Tracy Robertson. I like this bouquet, beautiful! I voted for your Mom on ICE.coms Beautiful Mom's contest. She sounds absolutely wonderful! I hope she wins! I follow you on Twitter (@aeris321) and tweeted! I entered the CleanRest Pillow giveaway! twitter follower of Tracy I.
am openly following via Google friend connect. I put the wrong follower name for the newsletter. I am following under "Tracy Robertson" thanks! This arrangement is so pretty! I’m a 1-800 Facebook Fan Jennifer G.
I like the Gardenias In A Basket. I love the Mom's favorite roses!